S.T.A.R. Puppy Test - Establishment Dog Training, Ltd. 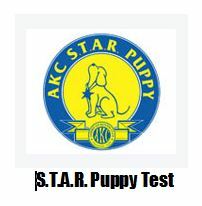 The AKC S.T.A.R. Puppy Program is designed to recognize dogs that have good manners at home and in the community. This rapidly growing nationally recognized program is designed to get dog owners and their puppies off to a good start. Training classes teach you how to best communicate with your puppy. Organized training classes also provide your dog with the opportunity to socialize with other dogs. In classes aimed at earning the ACK S.T.A.R. distinction, you will be able to get information on all of your puppy raising questions including house training, chewing and the most effective way to teach practical skills such as coming when called. AKC S.T.A.R. puppy training is a natural lead in to the Canine Good Citizen Program. When you complete a training class (taught by a an AKC approved CGC Certified Evaluator) with your puppy (up to 1 year old), your puppy is eligible to enroll in the AKC S.T.A.R. Puppy Test. You will be registered to take the S.T.A.R. Puppy Test at the next scheduled testing session. Upon passing the test, you will get an application to send to the AKC for enrollment in the AKC S.T.A.R. Puppy Program. All dogs are welcome to participate in the AKC S.T.A.R. Puppy Program including purebreds and mixed-breeds. All dogs that pass the 10 step CGC test will receive a certificate from the American Kennel Club. If your purebred or mix-breed dog has an AKC, PAL or Canine Companion registration number, the S.T.A.R. Title will be added to his or her registered name. Our trainer is a Certified Canine Good Citizen Evaluator. Our Canine Good Citizen classroom course will teach the skills required to pass the Canine Good Citizen Test. Graduation exercises for this class will be conducted in the form of a Canine Good Citizens test. If the dog and the handler passes the test, the Trainer will award them a qualifying score and the AKC paperwork which will allow them to apply for the S.T.A.R. Puppy Certificate from the American Kennel Club. Ask us about registering your non-registered purebred or mixed-breed dog with the American Kennel Club to permit your dog to obtain the CGC, S.T.A.R Puppy and CGCA titles. We can provide you with registration forms and information.